Bronze is derived from the Italian Bronzo, meaning bell metal. Bronze is one of my absolute favorite metals. It machines beautifully and polishes even better. It such an awesome metal it had an entire Age named after it. During the Bronze Age, man started forging alloys of copper looking for ways to improve upon the hardness and edge holding capabilities of the metal, they found through the addition of tin, they could make a much more durable metal that quickly became the defacto tool making material of that Age, only to be replaced with Iron once that smelting process was discovered. 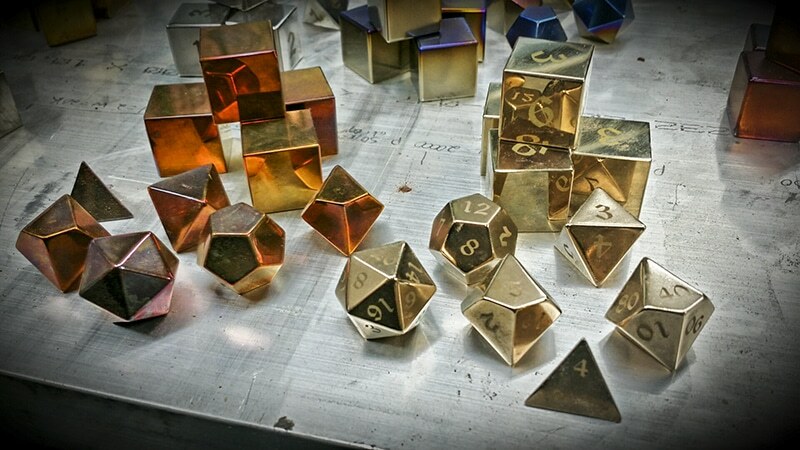 The Bronze alloy we use in our dice is Bronze 392. It’s commonly used for the manufacture of bearings and has a very low coefficient of friction and excellent machinability. A Bronze d20 weighs in at approximately 510 grains. Any chance you would make a bronze d20 with runic numbers? Hi Ed, we will be able to do that for you sometime in future, once we get past the mechanical issues we’ve had in making these cool metal dice. Same comment as above – I’d like to order a set. Any chance they’d be ready in time for Christmas, as well? Hello Maya, we are not taking new orders for Dragon’s Dice (metals) at this time. That is unfortunate being holiday season, I hope you guys get those mechanical issues solved! I cant wait to get my hands on some of these dice. Can’t wait to get my hands on the set I purchased 5 months ago. Probably no chance of seeing those by christmas either. Hi, How much would a complete set off copper dice cost? (1d20,1d12,2d10,1d8,1d6,1d4) do you ship worldwide? Nicolas, If the price doesn’t show on an item like this, it is not currently available they have a long backlog of customers waiting. But the set they sell them in is 1d4, 4d6, 1d8, 1d10, 1d100, 1d12, 1d20 and it was a couple hundred dollars for a set. Thank you for your clarification! I will keep an eye for when the are available again then. Will these be available soon? I would like to get them for an anniversary present for my husband but I need to be sure they will arrive by May. Please let me know if they will ship and be available by then. Jenn they still haven’t gotten the ones out from the kickstarter in 2013. So no. Won’t make it to you by May. Noticed the last comment was from last year so I’ll go ahead and ask the nagging question, will these die be back in stock any time soon? right now we’re working as fast as we can to fill our current titanium orders. as we get caught up on those we’ll be adding back in the rest of the metals. Do you have an ETA when these will be back in stock? 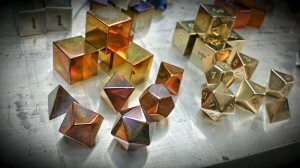 I really would love to have a set of bronze D6. we’re hoping to have these available in the fall. Hey, is there any chance you’ll be making these again anytime soon? I’ve been checking the page periodically for a good year and a half now, and I’m sitting on some gift cards in the hope that I’ll be able to pick up a full set of these.